How about some yummy food for a Friday? We have a favorite sushi restaurant. When we really feeling like splurging, we get the baked bananas dessert. I don't even know the real name, and they don't list desserts on their online menu. 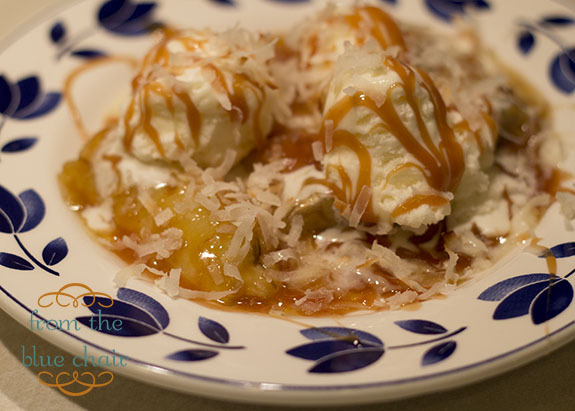 I'm sure it's something fancy, but we're going for descriptive today--Baked Bananas with Coconut Ice Cream and Salted Caramel Sauce. It's AMAZING! We just went out last weekend and experienced this dessert again. I decided I was on a mission to replicate it. I figured I could Google it and find something similar, but I didn't. After searching and adjusting multiple recipes this is what I came up with. It's happily very similar to the dessert at the restaurant (The hubs reported he couldn't tell a difference). Our kids did not appreciate the baked bananas, but they loved the coconut ice cream. I just think the whole combo is quite enjoyable. I didn't take any pictures of the process because I figure you all are capable of making this without a gazillion pictures from me. I didn't really think about blogging this until I was almost done, and the husband deemed it a great success. It's pretty straight forward and easy, but takes some thinking ahead. Head over to BettyCrockerAss and make her Salted Caramel Sauce. It's the best there is. Don't get lazy and buy regular caramel from the store. You need this. Stir everything together and dump in an ice cream freezer. This was the perfect amount for my Kitchenaid. This ice cream does not totally set up in the ice cream freezer. Once it's soft-serve consistency, move it to a separate bowl and place in the freezer for several hours until it's nice and firm. Place about 1 cup sweetened flaked coconut in a shallow pan and toast under the broiler until it begins to brown. Set aside. Slice bananas in half lengthwise. Place flat side down in a greased baking dish. Mix melted butter and sugar, spread on bananas. Place under the broiler for about 8 minutes. Remove when the bananas begin browning on top and the sugar mixture is bubbly. Serve bananas immediately, topped with a couple scoops of ice cream. Drizzle with caramel and sprinkle liberally with toasted coconut. It's quite divine (and I don't even like bananas). Kati... you can cook the banana in a pan with a little butter... its "bananas" hehe. Have you tried frying a banana in a egg roll wrap... Its probably the best thing I have ever eaten. Sounds delish! good for you for trying to duplicate a favorite! Holy gee-willikers, this sounds good!!! This sounds divine. Thanks for sharing this, I'll have to try it sometime! I just made this for our Valentine's treat and it was definitely one of my favorite desserts ever. The kids didn't love the bananas, though the boys did eat them. This is amazing! Thanks for putting this together!